This self-development book offers practical steps to consciously create a life of rewarding challenge, fulfillment, and achievement. Using his own life experiences and wisdom as the roadmap, Ryuho Okawa inspires us with practical steps for building courage, choosing a constructive perspective, finding a true calling, cultivating awareness, and harnessing our personal power to realize our dreams. Think Big! offers the support and encouragement to shift to new ways of thinking and mastering self-discipline. Okawa's self-proven approach fosters stability and strength in the challenges each of us faces. 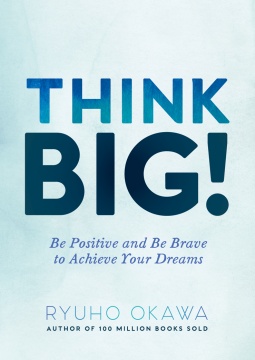 In addition to his relatable stories and a motivational voice to keep us going, each chapter builds on the next for concrete methodologies that, when added up, are a track to support your dreams, yourself, and your life. Put in place, these day-to-day life tools can help us in living courageously with no regrets, and maximizing our potential. Think Big! also offers the map that helps us confront self-doubts and move us past discouraging obstacles. This book lets us shift our perspectives on failure and vulnerability, learn to charge toward difficult situations, and move away from judgment when we make mistakes. Fast-tracking our goals takes more than just positive thinking – it takes a plan, passion, action and habits that create success. Okawa's simple, relatable wisdom is outlined to cultivate knowledge-seeking, motivated beings that translate personal visions into action for greater happiness and success. Off the pages comes the courage to get unstuck, get clear and focused, and get into action. The transformation is simple; it starts with thinking big. Think Big! – a self-development book that can make a big impact toward a meaningful future. - Radio interviews and giveaway programs in major cities. - Press releases to print journalists throughout the country. - Publishing Industry Trade Press Advertising including PW.